St Kitts and Nevis is located in the northern Leeward Islands of the Caribbean, offering a myriad of activities and opportunities. St Kitts and Nevis offers natural beauty, rich culture and long history. 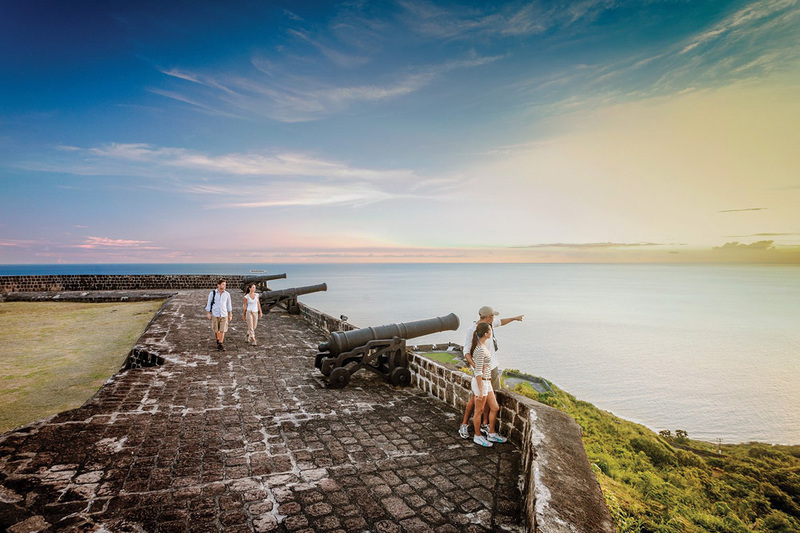 Whatever your tastes – for hiking, for watersports, for fishing, for sailing, for golfing, for diving, for eating or for simply relaxing on a beach, St Kitts and Nevis has it all under a clear Caribbean sky. Explore St Kitts’ thriving rainforest. The outdoor life isn’t all about the water. Visit the coastal rainforest, which is actually growing not receding as it so often is elsewhere, and visit the Valley of the Giants. Climb to Mt. Liamuiga’s volcanic crater or cycle the hills of the Southeast Peninsula. All land above the 1,000 ft. contour is National Forest Reserve where you can take one of the many winding trails and walk under a canopy of green leaves brightly coloured flowers and all the while surrounded by nature. Nevis is a smaller island of only thirty-six square miles. Incredibly unspoilt, unpopulated and laid back, it boasts empty beaches by the mile. Pinney’s Beach on the outskirts of the capital Charlestown for example, is just one of the perfect places where you can truly get away from it all. If a walk with a golf club is your hobby, then the famous 18-hole championship Royal St Kitts golf course set on 125 acres will delight you. Where else can you play with a view of the Caribbean Sea and the Atlantic Ocean? Or head on over to Nevis to play the memorable Robert Trent Jones 18-hole course. Whether you are a novice or veteran, the islands offer exceptional fishing and diving for the enthusiast. There are myriad of wrecks, pristine reefs, walls and caves in which to dive and these also form natural homes for game fish to deliver great sporting memories. Join us as a citizen. As an Economic Citizen you will hold a passport issued by St Kitts and Nevis, which entitles you to life-long citizenship and a right to reside on the island. And you won’t be taxed on foreign income, capital gains, gift, wealth, and inheritance tax. You can relax in your own home and enjoy the delights of St Kitts and Nevis whenever you like. FACT: The islands of St Kitts and Nevis are located in the eastern Caribbean roughly 1,200 miles from Miami, 1,600 miles from New York, 4,000 miles from London and about 45 minutes by plane from Puerto Rico and the US Virgin Islands.